After an impressive H1, in which more than 1,370,000 sqm of office space was let, Q3 2018 saw activity slow somewhat, with 503,625 sqm let, (down -25% q-o-q). A quarterly drop that did not, however, dampen the Ile-deFrance market. In the first nine months of 2018, take-up reached 1,874,000 sqm, up 6% compared to the same period last year during which results were excellent. Geographically, most Ile-de-France markets are riding the wave. Take-up rose in Paris (+5%), as well as in La Defense (+18%), and the Inner and Outer Suburbs (+11% and +25% respectively). The Western Crescent is the only exception, with a slight drop in activity (-4%). Activity is also balancing out, from West to East, and from the centre to the periphery, notably benefitting the Inner and Outer Suburbs. 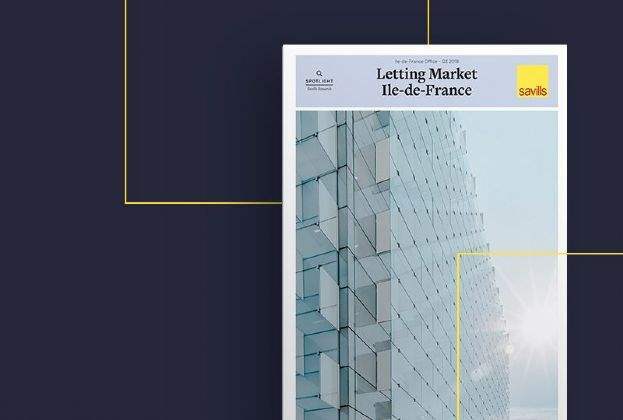 Although one cannot say the city is languishing – its grip on the lettings market remains clear (42% of take-up in Ile-deFrance) – the margin of its growth is narrower than it is in other sub-markets. Firstly, because market activity in central Paris has been strong for several years, and secondly because there is ever dwindling available space. Furthermore, there are various pockets of differing activity levels in the Central Paris market. 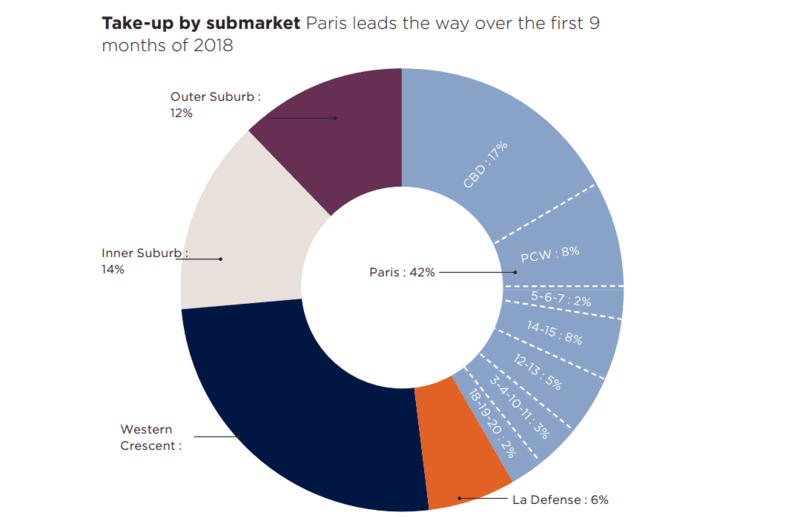 While activity in Central and Northern Paris (most of the south bank of the Seine) increased significantly, up +16% and +7% respectively, Southern Paris (the left bank and the 12th district) saw a drop of -14% (due to a normalisation of activity in the Paris 12-13 districts, after 2017 saw figures inflated by the exceptional 90,000 sqm Tours Duo letting). Paris Centre West (exc. CBD) recorded the most spectacular growth, with almost 145,000 sqm let in 9 months – 67% growth in the lettings market y-o-y. Large lettings have driven this unprecedented level of activity, including the Murex deal for almost 17,000 sqm in the Freedom building. In the CBD, the market even outperformed last year’s results, with 326,155 sqm let, and grew by 2.3% despite shrinking supply. Based on 2017’s excellent results, this modest growth is a feat in itself. Take-up for small offices, the main driver of activity in 2018 – accounting for half of lettings – remains stable (around 159,000 sqm let). Transactions for space between 1,000 and 5,000 sqm are up 19% y-o-y, balancing out the drop in take-up for offices exceeding 5,000 sqm (-14%). Occupiers looking for large premises are currently struggling to position themselves in the CBD due to a lack of available space and rising asking rents. The market in La Defense is up 18%, leaving its sluggish start to the year behind and growing across all size categories (+21% for small lettings, +17% for medium-sized spaces and finally +18% for large transactions, with 6 deals signed since Q1 2018). In the Inner Suburb, an upward trend has also been observed, with the South and East submarkets seeing take-up spike (+57% and +42% respectively). The strength of the market in 2018 is primarily due to the completion of large deals – at least 10 signed since the beginning of the year, of which 6 were for over 10,000 sqm. In contrast, the North sub-market is down -38% due to few large transactions, however, the situation should pick up by the end of the year. This strong lettings market performance has also filtered through to the Outer Suburb, except for the St Quentin and Pôle de Cergy submarkets. 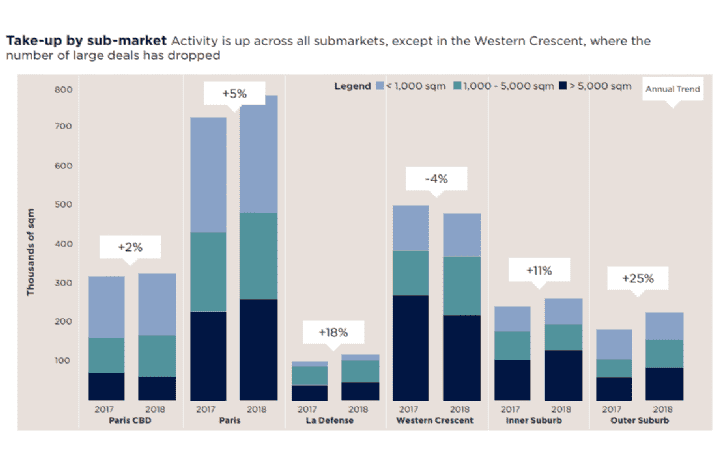 Currently, there is an unprecedented situation on the Ile-de-France market in 2018; the Western Crescent seems to be losing steam. While the Peri-Defense and North End sub-markets have posted acceptable results, they are not enough to compensate for the drop in Neuilly-Levallois and the South End. After an upbeat 2017, particularly for the large lettings segment, these two key markets in the Western Crescent have been unable to repeat the performance. Not a single transaction for space exceeding 5,000 sqm has been signed in Neuilly-Levallois since the beginning of the year, and only one deal – albeit it a large one – was recorded in the South End (Nestlé for 45,000 sqm). 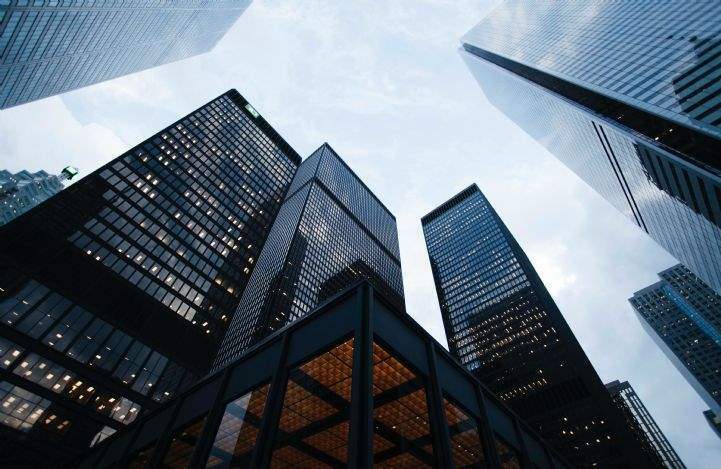 The strength of the market is largely thanks to transactions for offices exceeding 5,000 sqm, which continue to drive it upwards and account for 40% of take-up. Take-up for this size category was up 3% at 9 months 2018. While not spectacular, this increase is still remarkable as it is based on 2017 results, which saw an unusually large amount of occupiers looking to lease large spaces. Therefore, the market has not just maintained this level of activity, but has managed to step it up. At the end of Q3 2018, the segment for lettings exceeding 5,000 sqm represented 40% of total lettings activity. Paris, co-working companies have been particularly active on the large lettings front, leasing more than 70,000 sqm since the beginning of 2018. Unsurprisingly, these occupiers target the best assets and prefer the central districts (CBD, and more widely, Paris Centre West). However, they are not limiting themselves to these areas and are now looking to extend to the entire city, particularly Paris 3-4-10-11 Districts and Paris 12-13 Districts. WeWork is the outright winner for co-working lettings in 2018, completing five deals for an average unit size of almost 10,000 sqm. Occupiers looking to let large offices preferred the area surrounding the CBD: Paris Centre West (exc. CBD) accounted for 26% of take-up for spaces exceeding 5,000 sqm (ahead of the CBD, with 22%). This market’s healthy supply is the reason behind its success – a market that after growing very steadily has only recently made its mark on the lettings market and is now a valid option considered by all businesses looking for space. In the immediate periphery, the profiles of occupiers looking to lease large spaces are more diverse. Strong activity among companies in the real estate sphere has been a feature of 2018; Kaufman & Broad took 9,000 sqm in Courbevoie, Nexity PM 10,000 sqm in Asnières-surSeine, and Vinci chose Nanterre for its campus of over 60,000 sqm. As a consequence of upbeat lettings activity, immediate supply throughout the Ile-deFrance region has fallen significantly. In one year, it has dropped by 15%. For the first time in almost 10 years, immediate supply has dipped below the 3 million sqm threshold (2,958,000 sqm). The lack of supply is weakening the market The fall in immediate supply is becoming more widespread: the average vacancy rate for the Ile-de-France region stands at 5.5%. A few areas are proving to be exceptions however, such as Paris 14-15 Districts and the South End, where available space is on the rise again, thanks largely to strong construction activity. In the CBD, the vacancy rate has fallen to 1.5%, and immediate supply is barely enough to satisfy one month’s worth of activity. This phenomenon is becoming widespread across all Parisian districts, particularly affecting occupiers looking for small and mediumsized spaces. Occupiers looking to lease large offices are primarily focusing on future supply. The situation is relatively similar in the La Defense business district (-45% in one year), with a vacancy rate under 5% (4.5%). Nevertheless, confirmed future supply remains significant (more than 200,000 sqm expected within 2 years). The Western Crescent and Inner Suburb have avoided this problem, here the drop in supply was less severe and there is still considerable overall volume available to occupiers. 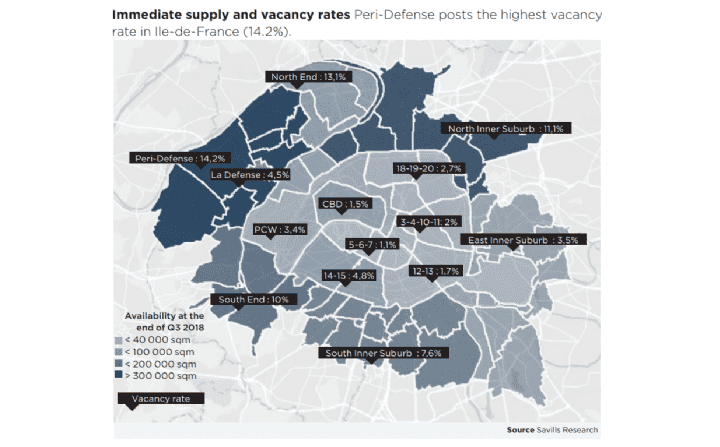 For example, at 14%, Peri-Defense posts the highest vacancy rate in Ile-deFrance, followed by the North End at 13%. This relative “generosity” is likely to be an advantage in a context of scarce supply. High take-up mixed with depleted supply is putting increased upward pressure on rents, with values spiking significantly, particularly in the main business districts and their immediate surrounding areas. In the CBD, the average rent for new builds is currently estimated at €750 per sqm/year. However, for certain buildings, rents well above €800 per sqm/year have been or will be agreed. These high-level rents are still exceptions, but they have a major psychological effect on the market and are expected to fuel the upward spiral over the coming months. Surrounding the CBD, the Paris Centre West submarket finds itself in the grip of a certain ‘fever’, linked to increasing commercial success and the creation of exceptionally highquality supply: the average rent for new builds now stands at €683 per sqm/year, up 23% y-o-y (the highest y-o-y growth). For the first time this phenomenon is no longer confined to central Paris. It has spread to other submarkets popular for proximity to business centres and for the quality of transport links. In contrast to central Paris, where pressures have driven up rents for existing stock, the increase in rental values in peripheral areas is limited to the highest quality buildings. The peripheral markets that have suffered from lower levels of lettings activity since the beginning of 2018, are not experiencing the same upward pressures. Several of them are seeing rents stabilise or even fall: in the South End for example, rents dropped -11% to stand at €393 per sqm/year (the sharpest drop in Q3 2018).